In today's fragmented media environment finding good advertising resources is ever more difficult. It used to be that if someone were interested in finding a puppy the first place they would turn would be their local newspaper's classified section. If you have referred to local print classifieds recently then you realize this is no longer the case. What used to be pages of ads for pets has been often reduced down to a single column if not completely removed. So where do you turn now when you are looking for a good resource for marketing your Pit Bull pups and finding Pit bulls for sale? How about when looking for a mate? These tasks have become ever more complex, expensive and in many cases perform poorly. 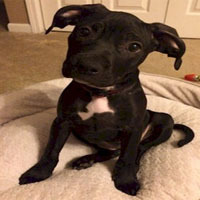 At the American Pit Bull Registry we have a perfect solution for you. 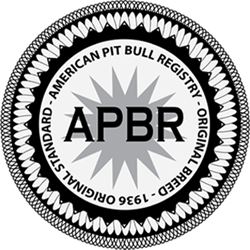 Through our APBR Member Classifieds you can easily find Pit Bull puppies in your area as well as find listings for mating and APBR Certified Kennels absolutely FREE. 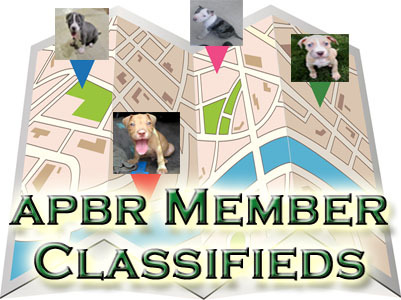 If you are looking to sell a recent litter and if you are also an APBR member you can place FREE ads as well. Not just a single ad but as many ads as you have pups. We even encourage an individual ad per pup. Even better is that with each ad a poster can and is encouraged to provide pictures. This gives the viewers a chance to see more specifically what pups and mates are being advertised and thus encourages greater response rates. While in today's world no single advertising source will meet everyone's needs at the APBR our websites receive millions of hits regularly and thus make it one of the best options available. With our classified and kennel listings if you are an enthusiast you are sure to find just the perfect Pit Bull to suit your interest. 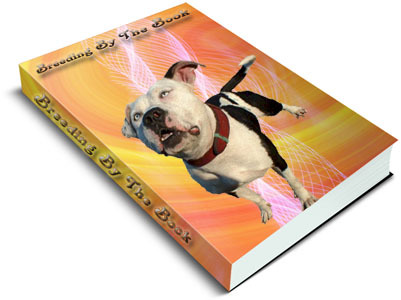 In addition to our advertising services we also provide our own written resource called "Breeding By The Book". This book provides a detailed overview that is critical to any breeding establishment but is also a premium resource discussing a full array of marketing techniques sure to give its owner a competitive advantage in the sales market. For the breeder there is no better resource on the market to take them successfully from finding a mate, preparing for birth, insuring healthy outcomes, marketing their offspring and finding high quality long-term loving homes. Make sure to order your copy today! "Just opened up the new site-and I am tickled pink that you have used 2 of our dogs. I love the lay out and the directions you are going. I love this kennel club and every one that buys from us tell us they love it also. Thanks for every thing. 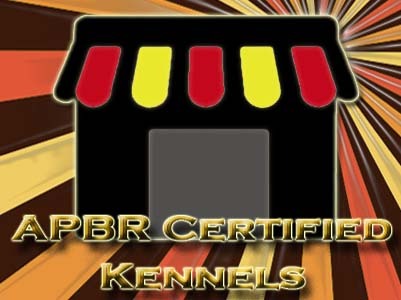 We have been covered up with inquiries about our pups through the APBR puppy site. As always the site looks great. Thanks for every thing."